Associated Gallery, Outlet Fine Art, and Parallel Art Space (Brooklyn) together with visiting international art spaces; FORT Gallery (London), Artist Proof Studio (South Africa), and Telescope (Beijing) proudly present, Altered Terrain: a four day co-operative art exhibit wherein 12 artists selected from the six galleries are featured at The Active Space Gallery, a 1600 square foot exhibition space within a 100 year old industrial building (formerly a feather factory), in North Bushwick. 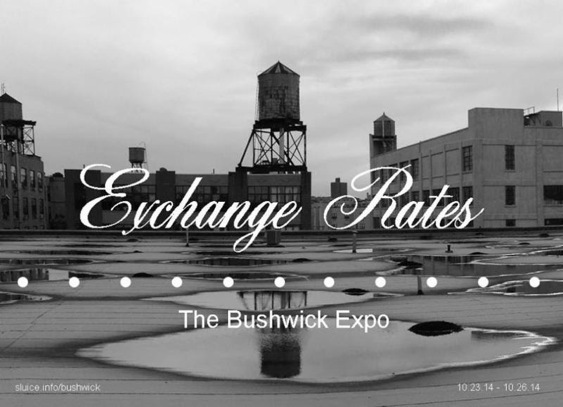 Organized as part of the neighborhood wide Exchange Rates: The Bushwick Expo, itself a collaboration between local galleries Theodore:Art, Centotto, and UK based Sluice Art Fair, Exchange Rates: The Bushwick Expo is an invitational exposition of art galleries from Bushwick, Brooklyn and collaborating international galleries from seventeen cities around the world culminating in a week of joint exhibitions. Altered Terrain assembles artworks in a range of media, within a loosely cordoned area of multiple concerns; those centered on land, the environment, place of origin and the enduring influence of one's environs. From sculpture to works on paper to video, the twelve artists here touch upon a variety of questions: "What are the meanings, both personal and political, of 'land' and 'environment'? "; "How do shifting notions of place both contribute to and/or detract from a larger creative inquiry? "; "Where is the locus of concern, aesthetically speaking, with regard to place of origin, class, mobility, and accessibility? "; "In a geo-political landscape, how do issues regarding conservation, entropy, and sustainability enter into and inform the contemporary artists' oeuvre?" Please join us for the opening reception of Altered Terrain on Thursday, October 23 from 6-8 PM. The exhibition will remain open from 12-6 PM October 23 through October 26 at The Active Space, 566 Johnson Ave, 2nd Floor, Brooklyn NY 11237. Julian Lorber's work, while often abstract, is deeply concerned with the natural environment. His signature style of built up surfaces call attention to air pollution by mimicking the effect of soot buildup on brick façades though the use of calculated and skillfully applied airbrush gradients to layered surfaces. His fantastic color range and adept deployment of technique allow him to create paintings that both amaze and invite contemplation, compelling the viewer on both a formal and conceptual level. Julian Lorber (b.1985) as a graduate of Massachusetts College of the Arts, he lives and works in Brooklyn, New York. He has shown broadly in New York including recent shows at the Williamsburg Art Historical Center, C24 Gallery and Margaret Thatcher Projects, and internationally including solo show, "Externalities" at Gallery Lot 10 in Brussels, Belgium. Matthew Shelley's recent works on paper combine a keen understanding of perspective with playfulness in regard to form. Collaged monochromatic cutouts of natural scenes appear to fold and bend over one another but actually remain flat, while the paper surface to which they are applied is folded and twisted adding an element of depth that both mimics the visual effects of the collage while simultaneously confronting it. Rob Leech's works are concerned with, among other things, the immediate environs of place and time. With interests including the tete-a-tete influence of the natural environs on the human form and vice versa, Leech makes omnipresent structures and commercial objects the carriers of his artistic inquiry. From paint cans to inflatable balloons to shadows and textures upon an interior wall, the artist brings the everyday and the readily overlooked into sharp consideration, altering the experiential relationship of the viewer to his or her immediate yet ever changing station. Rob Leech (b. 1983) Lives and works in London. He received a post-graduate diploma from the Royal Academy Schools, London in 2009. Selected exhibitions include the Sluice Art Fair (London, UK), 7 Dunham Gallery (Brooklyn, NY), The Barbican Centre (London, UK), Depot (London, UK), UNO+UNO (Milan, IT), and Transition Gallery (London, UK). He has served as a Guest Lecturer at Bath Spa University College in Bath, England and is the Director and Curator of FORT Gallery in London. Robert Pratt's sculptural practice reclaims the ubiquitous and banal objects of our day-to-day lives to recontextualize them into a new sphere of consideration. Rolls of paper, crumpled forms, vats of paint or a stack of old carpet samples are a few of the components of Pratt's investigations. With nods to both the ready-mades of Duchamp and the pared down forms of Minimalism, Pratt's work begs us to consider more closely the inherent artwork of our human surround and the non-considered master-works of chance, convenience and the cast-offs of human industry. Robert Pratt (b. 1984) Lives and works in London. He graduated from the Royal Academy Schools, London in 2009. He has had solo exhibitions at The Cello Factory (London, UK), Royal British Society of Sculptors (London, UK), and ANDOR Gallery (London, UK). Selected group shows have been held at Poppy Sebire Gallery (London, UK), Simon Oldfield Gallery (London, UK), FAFA Gallery (Helsinki, FI), and Vilma Gold (London, UK). Recent awards include the AA2A Residency at Camberwell School of Art, the Royal British Society of Sculpture Bronze Award, and The Patricia Turner Award for Sculpture. Joshua Johnson's diverse sculptural practice incorporates interests in philosophy, physics, evolution, and post-capitalism. In materials including petrified wood, fossils, plexiglass and consumer objects, Johnson frames the movements of certain universal forms, positing them within a larger adaptation-extinction narrative. By examining the evidence of the human trajectory, from technological to archaeological and back, Johnson foregrounds the questions of our empirical present, the steadfast hazards of human history, and the uneasy forecast of our uncertain tomorrow. Joshua Johnson (b. 1981) Lives and works in New York. He received an MFA from Hunter College in 2011. He has exhibited work at Bureau Inc. (New York, NY), Louis B. James (New York, NY), Martos Gallery (New York, NY), Magic Pictures (Philadelphia, PA), Parallel Art Space (Ridgewood, NY), and NADA Art Fair (New York, NY) among others. He was a resident artist at the Fiskar's AiR program in Finland and recently organized and edited Dark Trajectories, a volume of philosophy with contributions from Reza Negarestani, Levi Bryant, et al., which was published by [NAME] (2013) He is also a founder and organizer of Fixing the Future, a series of on-line seminars and public forums; "Taking up strategies in economics, theory, philosophy, and art, Fixing the Futurelooks to provide useful alternatives for thinking the future again, and to do so as an imperative." Frank Zadlo's forms, rendered in concrete, plywood, and found objects allude to architecture, Minimalism, and the readymade, capitalizing on the serendipitous intersections of pre-engineered composition and intention. Employing humor, wit, and a keen repurposing of art-historical tropes, Zadlo implicates the human presence within the "natural" sphere and highlights the ever-present wisdom of objects to impress upon and influence their environs. Conflating form, purpose, and providence, the elements of Zadlo's objects transcend the pre-supposed borders of time and original design, to commune in ways unpredictable and ultimately unprecedented. Frank Zadlo (b.1979) Lives and works in New York. He received an MFA in Fine Arts from Parsons in 2008. His work has been exhibited at Victori Contemporary Birnam Wood Gallery (New York, NY) Young Projects Gallery (Los Angeles, CA), Torrance Shipman Gallery (Brooklyn, NY), Parallel Art Space (Ridgewood, NY) and NURTUREart (Brooklyn, NY). The L Magazine, Hyperallergic, and NY Arts Magazine have covered his works and he was a 2008 Grant Nominee for The Rema Hort Mann Foundation. Heeseop Yoon creates dense and kinetic wall tapestries that are inspired by the memory and perception of cluttered spaces. She uses photographs of interiors such as basements, workshops, storage spaces, and studios that are cluttered to the point of obscurity, with no trace of human presence. Yoon draws her subject matter freehand on sheets of transparent polyester film with black tape and then attaches Mylar panels to the gallery wall. Her site-specific work investigates the materialism and consumption that clouds our perception. Heeseop Yoon was born in Seoul, Korea and received her MFA at the City College of New York, City University of New York in 2004. Recent exhibitions have included a one person show at the The John and June Allcott Gallery, University of North Carolina, NC (2014). Other shows: Stil.Life, OUTLET, Brooklyn (2014), Heeseop Yoon, University of Nevada, Reno, NV (2013), Desaturated Rainbow, Bicoastal exhibition, Paul Kopeikin Gallery, CA (2013), Crossing the Line: Contemporary Drawing and Artistic Process, Mixed Greens, New York City (2013), Parlour - No. 22 Archival Matters, Amagerbrogade 190, Copenhagen, Denmark (2012), Line Unleashed, John Michael Kohler Arts Center, Wisconsin (2012) and Artspace Mackay, Australia (2012). Christopher W. McDonald works in the medium of photography and video, although his approach to photography is less as a medium and rather as an idea or technology to deconstruct. McDonald's work of the last few years, his growing passion for abstract, minimalist and conceptual art is also apparent. His different series of art may appear wildly unique in appearance but each is moved by the transformative power of ideas embodied in the materials of art. In "pure frank sentiments" McDonald has rendered a large, pixelated image of an environment using individually exposed prints using a computer screen as the light and image source. Christopher W. McDonald (b. 1983) is a prolific photographer, filmmaker and musician based in Killingworth, CT. He has shown in numerous group shows and performances including recent solo exhibitions "Bored Horny" at the Jacqueline Falcone Bed & Breakfast, Miami, FL (2014) and "Figure Found" at Brickbottom Gallery, Somerville, MA (2013). Other shows he has been featured in: "Fresh 10!" Outlet Fine Art, Brooklyn (2013), "New. New York", Essl Museum, Vienna (2012) and "Coming and Going", NYCAMS, New York City (2011). Bai Ye is one of the earliest pathfinders and organizers of Xi'an Textile Town Art District. In the Textile Town Art District era, he actively promoted the construction and development of contemporary art district, and has participated in almost all exhibitions in the art district as well as some exhibitions of Xi'an performance art. In his current photography work, Bai Ye's photos are made with his mobile phone and can feature abandoned buildings, anonymous figures and nondescript landscapes. These resulting images that further abstracted through the digital medium are alien and haunting, the landscapes are imbued with the hope of transcendence and flight but still mired in a dark oppressive reality. What seem to be moonlit nighttime skies are really just opaque concrete walls. Bai Ye (b. 1975) is from Jingbian county, Shaanxi. He graduated from Xi'an Academy of Fine Arts and now works and lives in Xi'an. His most recent solo exhibition "Unapproachable Light", was at Telescope, Beijing (2013). Group shows have included Artworks Exhibition, Beijing (2011), Bai Ye & Shi Hengbo's Exhibition, Los Angeles (2011), The First Chinese Art Community Cultural Festival "Daily Life: Yunnan Style,"
Kunming (2011), and Song Zhuang Art Festival, Beijing (2010). Wu Xiaowu is a painter whose practice is grounded in keen observation transformed into poetic and visionary paintings. His childhood fascination with rocks relates to his culture heritage that reveres rocks as testaments of history and a source of inspiration. They are markers in the landscape that record the passage of time. Wu Xiaowu (b.1985) is from Zhuzhou, Hunan Province, China. In 2009 he graduated from the Photography Department of Modern Art Institute of Tianjin Art Academy and currently working and living in Beijing. Xiaowu's solo exhibitions include "OCAT Xi'an Museum summer projects: curatorial plan" (Xian, China, 2014), "Wu Xiaowu" Telescope,(Beijing 2014), as well as several significant group exhibitions: "1st Beijing Photo Biennial" (Beijing 2013), "Daegu Photo Biennale"(Daegu, Korea, 2012), "Art Media Editor Sharon Nominate Exhibition" (Beijing 2012), "Magic" Art Channel Gallery (Beijing 2010), "Art Beijing/Photo Beijing" Contemporary Art Society(Beijing 2010), "Pingyao International Photography Festival"(Shanxi Province, China 2008). Bevan de Wet states "my artistic practice engages with various symbolic and cultural meanings surrounding the body. I use the skin as a surface for patterning, mapping and fragmenting the boundaries of the body. Through exploring notions of masquerade I am creating my own mythological language, which I use to deconstruct history and identity. Seemingly disembodied parts act as masks, giving figures a new and imagined character, often theatrically interacting with other figures. The reconstructed images negotiate the dichotomy between the civilized self and the instinctive, untamed self. By working with fragmented components, I examine notions of displacement and belonging thus evoking a sense of unease and disconnectedness." Bevan de Wet studied printmaking at Rhodes University, Grahamstown, under the mentorship of Dominic Thorburn, Christine Dixie and Diane Victor. After completing his Fine Art degree with distinction, he began working as an artist and printing his own work at Artist Proof Studio in Johannesburg. At the end of 2010 he returned to JHB where he began working as a Collaborative Printer at David Krut. He now works at Artist Proof Studio full time as a printmaker, facilitator and practicing artist. He has worked with artists such as Gerhard Marx, Walter Oltmann and William Kentridge. In 2012 Bevan was awarded a fellowship from the Ampersand Foundation and also received the Thami Mnyele Art on Paper Merit Award. Jan Tshikhutula mainly works with linocuts and his subject matter is inspired by nature and the rural Limpopo landscapes. He view the objects in his landscapes as vessels that hold links to his background and deceased family members. His landscapes depict relationships between family, colleagues and friends. Tshikhutula is based in Johannesburg, South Africa.